Almost 20 years after The Lion King pounced into our hearts as a tear-jerking classic, Disney is bringing the pride back in an...interesting way. A new animated series aimed at preschoolers, Lion Guard, will air on Disney Junior and the Disney Channel starting November 2015. 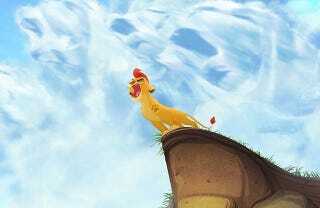 It will feature Kion, Simba's son, protecting the jungle from a variety of threats with his team of friends. It is also likely a ploy to get adult fans of the franchise to encourage their kids to tune in. According to Disney Junior general manager Nancy Kanter, "It's kind of like The Lion King meets The Avengers." Because that's exactly what fans of the original have been asking about for years. "Where is my Lion King/Avengers mash-up?" This is far from Disney's first attempt to capitalize on the popularity of The Lion King, though. There were multiple direct to VHS movies (staring Simba's daughter Kiara, no less. No word on whether she still exists or was banished to oblivion by Disney execs), a series featuring Timon and Pumba, and a Broadway musical that did pretty well for itself. It joins Disney's other recent attempts to spin-off old franchises: Peter Pan's spin-off Jake and the Never Land Pirates and Sleeping Beauty's spin-off Sophia the First. There will also be a brand-new line of toys to accompany the series, because you can't have good animated television if you don't sell toys along with it. Taken as a whole package, this whole deal smells a little fishy. Does the show only exist to drive toy sales or will it be treated seriously? Is the Avengers angle just to capitalize on the superhero craze or is this something the writers have thought through and works? It's far too early to tell, but call me skeptical. It's all well and good to show a new generation the magic of the original film, but this spin-off could just as easily turn new viewers off from the series if it's treated as a vehicle for merchandise.